Where does your favorite sweetener fit in? It’s official. Cleveland Clinic dietitians agree that the best sweetener is no sweetener at all. “Sugar and artificial sweeteners are addictive and will hijack your health and metabolism,” says Brigid Titgemeier, MS, RDN, LD. They stimulate your appetite, encourage your sweet tooth and pack on the pounds. And they place you at risk for obesity, type 2 diabetes, heart disease and fatty liver. But you’re human — so you probably won’t be quitting all sweeteners tomorrow. So we’ve polled our dietitians to highlight the worst and best options. These garnered the most “no” votes. Most people should step away from artificial sweeteners. With one exception: If you have prediabetes or diabetes, artificial sweeteners and stevia are preferable to real sugar. “Real sugar will immediately raise your blood sugar. Artificial sweeteners will not,” says Emily Bostin MS, RDN, LD. But “sugar substitutes can cause you to crave more sweet and sugary foods,” notes Kate Patton, Med, RD, CSSD, LD. 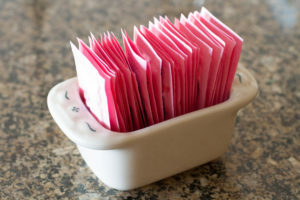 Studies link artificial sweeteners, considered safe in moderation, with a higher risk of glucose intolerance, a precursor to prediabetes and diabetes. They’re also associated with changes in gut bacteria and lead to increased fat storage. And who wants that? Table sugar is inflammatory, high in calories and offers no nutritional benefit. Plus, it’s already hiding in many of your favorite foods. Natural sweeteners provide a few more nutrients than table sugar. “But they are all still forms of sugar and high in calories, so use no more than 1 to 2 teaspoons per day,” advises Julia Zumpano, RD, LD. Raw honey contains antioxidant vitamins E and C as well as minerals, and pure maple syrup contains antioxidants. “Both have prebiotic oligosaccharides that help to feed gut flora,” says Ms. Titgemeier. High-fructose diets are linked to long-term metabolic complications like insulin resistance, belly fat accumulation and high triglyceride levels. Agave nectar — marketed as a safe alternative to sugar for those with diabetes — provides fewer nutrients than raw honey or pure maple syrup. Like agave, raw sugar has fewer nutrients than the other natural sweeteners. But — bottom line — when it comes to your metabolism, all natural sweeteners behave like sugar. Stevia — in packet, drops or plant form — is a dietitian favorite, especially when it’s 100 percent pure organic. “Not only are stevia-based sweeteners herbal as opposed to artificial, they also contain zero calories,” says Ms. Zumpano. Stevia blended with a sugar alcohol called erythritol (Truvia) works well in low-carb baked desserts, says Ms. Noe. “For a simple and easy sweet treat, mix 1 teaspoon of the sweetener with plain Greek yogurt and peanut butter. It tastes like peanut butter pie,” she says. The best way to sweeten food and drinks? Fresh or frozen fruit. “Fruit is a sweetener without any empty calories,” says Ms. Willoughby. Try sweetening oatmeal by mixing in banana or applesauce. Add berries to plain Greek yogurt or chilled water. Sweeten smoothies with frozen fruit. Or add naturally sweet flavorings like vanilla or almond extract, cocoa powder and/or spices. No sugar or sugar substitute is healthy in excess. “That’s true whether it’s in soda, sweet tea, fruit drinks, packs of sugar or sugar substitute for coffee or tea, or artificially sweetened flavor packets for water,” says Ms. Noe. Use a true measuring spoon to gauge how much added sugar you’re using daily. “Challenge yourself — your foods and beverages don’t always need to taste sweet,” says Ms. Zumpano. Try decreasing the sweetener in your coffee or tea by 1 teaspoon per week. Start diluting juices by mixing half your usual portion with water to retain some of the sweetness. That way, you won’t have to quit cold turkey. The end goal: Weaning yourself off sweeteners completely.